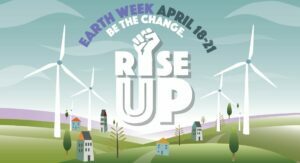 Earth Week 2017: RISE UP. BE THE CHANGE. On Tuesday April 18th to Friday April 21st, we have a very exciting line-up of activities for the campus to enjoy. Check out the poster below, or the chart for a more detailed explanation of events. Check back here to keep up to date on any changes to the schedule! We also have a bonus event on Monday April 17th by some student members of the campus sustainability community! Farmer’s Market, Seed Swap, Bike Mobile, and Plant Sale Vendors, food, music, and FREE bike repairs by Bike Works! Labour and tune ups included, some parts may be extra. Tips for Leading a Sustainable Lifestyle Presented by Nancy Lane’s class, there will be an interactive station on how you can make a difference! Conserving Marine Resources: The Need for International Governance Dr. Ernesto Penas Lado, Director for Policy Development and Coordination at the European Commission’s Directorate-General for Maritime Affairs and Fisheries will be on campus, all the way from Europe! He will give a talk on his experiences with the UN, ocean governance, and climate change! And much more! Check out this talk to learn more about his great climate work and life! Electric Vehicle Car Show and ASG "Zero Waste" BBQ Food, music, and awesome electric vehicles! Teslas, motorcycles, and more! Zero Waste BBQ means all supplies will either be compostable or recyclable. Let's get to zero landfill waste! Come out and get your hands into some dirt! Gloves and gardening tools provided, but please bring your own gloves if you have them!